I’ve been making a list of all the plants I want to grow in my garden. The list began a few years ago when I began noting plants that I liked, imagining how they would look in my future garden, well before I knew where or when this sanctuary might be. An artist collecting colours and textures for my paint box. I couldn’t wait to find a canvas. Hakeas, species roses (the original wild roses), a portwine magnolia (note: this can be grown as a hedge), Rosa glauca for its pewter coloured leaves, a mulberry, an all spice tree... It quickly became apparent that the list would require a notebook all to itself. And so it was born, a spiral bound book from the post office, covered in brown paper and the words ‘In the garden...’ inked in black pen across the cover. Inside are green tabs down the side of the pages, made of sticky tape and origami paper. A catalogue of each type of plant: ornamental, cut flowers, culinary, medicinal herbs, animal fodder (for chooks and other critters that might find a home in the garden), and dye plants, a ready pallet to indulge my love of putting natures colours into cloth. 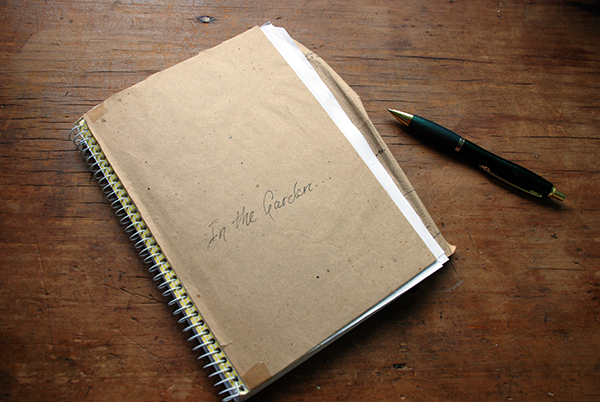 This is when my garden began, with this notebook. Now that I have an actual space of some 500m square, I feel hungry to begin. At the moment the garden consists of a green lawn edged in numerous pot plants, my portable garden. There are two apple trees, a 25th birthday present, waiting patiently in their pots for a roomier home in the earth. The orange trees, a blood and a navel, house warming gifts, still wrapped in black plastic. In the centre sits a relic of the petrified forest that once stood sentinel over this corner of the lake, a piece of stone cast in the mould of a large eucalypt skeleton. I think it once propped up a bird bath. Beyond that are the remnants of a market garden, in which we’ve thrown some vegies to keep our bellies full. I find restraint when I pick up ‘Your Garden Design Book’ by John Brookes. The only way I can see to fit in the long list of plants is to plan. The digging can wait. First to plot the plot.